Wisdom teeth are the final set of teeth that come in when a person is in their late teens or early 20s. When these teeth grow in properly they’re quite useful to individuals, however, more often than not they are misaligned, impacted, and can cause issues with surrounding teeth. This is why many people have to have their wisdom teeth removed. 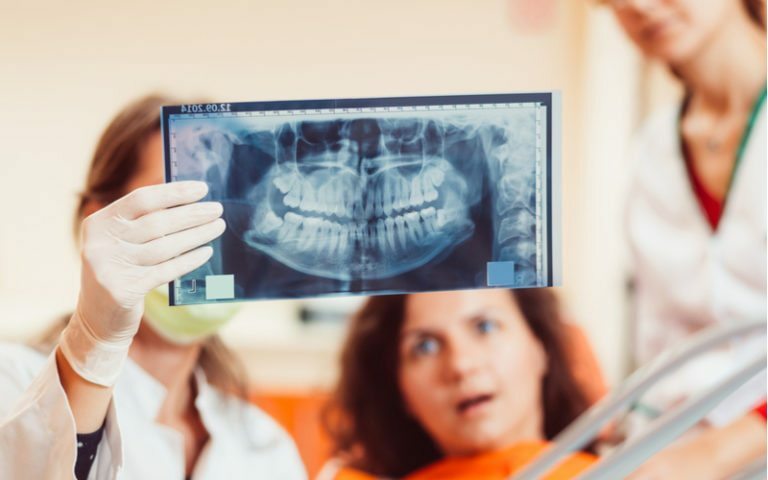 When wisdom teeth aren’t aligned correctly, they can be positioned at an angle, horizontally, or angled in such a way that they damage surrounding teeth, the jawbone, and nerves. Impacted wisdom teeth are buried beneath the soft tissue and either fail to break through the gum or break through partially. This can lead to an infection because it causes an opening for bacteria. Symptoms of an infection include a stiff jaw, pain, and swelling. Additionally, teeth that are partially erupted are more prone to decays because they are so hard to reach with brushing and flossing. The only way to know if you have wisdom teeth is to see an experienced dentist like Dr. Kronquist. He will perform a visual exam of your mouth to determine whether you have wisdom teeth or not and will use x-rays to understand their exact positioning. Depending on the position of your teeth, the doctor will either decide to wait to extract your teeth or will schedule an extraction. What he decides will depend on whether he determines surrounding teeth are at risk for damage. Wisdom teeth are removed through a surgery that usually required general anesthesia. The surgery itself is less than an hour, however, you won’t be able to drive home after an extraction. Recovery usually takes about a week. The dentist will instruct you to avoid chewing anything hard on the side of the mouth that had the extraction and to eat soft foods like mashed potatoes and jello while you’re recovering. After an extraction, you are likely to experience bleeding. You can reduce and stop the bleeding by placing a clean gauze over the area of extraction and keeping it there. Another trick is to use a moistened tea bag to help encourage clotting (something caused by the tannins in tea). You might also experience facial swelling, something known as chipmunk cheeks. You can minimize swelling by applying an ice pack for 10 minutes then removing for 20 minutes and repeating. The doctor may prescribe painkillers, like acetaminophen or Vicodin, to help ease any post operative pain. If you have questions about wisdom teeth or extractions, contact our team at Sunset Dental Group. Dr. Kronquist brings years of experience in wisdom tooth extractions. He can evaluate your mouth’s current situation and make a decision as to what course of treatment would be best for your needs. Additionally, if you need an extraction, our team is committed to providing you with an enjoyable, pain-free experience.